Bee on butterfly milkweed blossom. 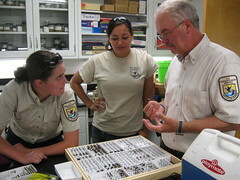 Photo courtesy of USFWS. Most often, bees are thought of annoying creatures that fly around in the summer, and occasionally sting. Biologist Wedge Watkins knows that isn’t the case. Bees are an essential part to the pollination and overall livelihood of flowering plants. These flying creatures are responsible for pollinating over 75 percent of flowering plants and almost 75 percent of crops. Because these creatures do not migrate, it is important to understand where the bees habitate. Without this knowledge monitoring plant communities and climate adaptation would be very difficult. Refuge biologist and Midwest Region Pollinator Coordinator Wedge Watkins shared information about these native populations of bees, an update on the Overton Bottoms survey, as well as his recent work with a new survey that started this summer. This new survey takes place along the Mississippi River and at nine different refuges. From LaCrosse, Wisc. to south of St. Louis, these sights have discovered species that are new to science; as well as, new state and county records. At some locations that were thought to be scarcely inhabited, bees have been found in large numbers. Wedge has been leading a sampling at Cora Island as part of the survey. Mike Arduser from MDC is doing the ID work with the survey. Along with Missouri Master Naturalists and a MU student, this survey has discovered many new findings and fascinating results.